We have all heard of the potential damaging effects of stress and negative emotions on our health, well-being and our quality of life. Stress, worry, anxiety and anger can also cause sleep deprivation and restless night's sleep and again, we have all heard how important it is to get a good quality nights restful sleep to promote good health and emotional well-being. Many people have simply forgotten what it is like to feel good and relaxed. Yet relaxation is a basic human need and necessity. Everybody wants to feel calm and happy. But, perhaps you have a stressful job or you're bringing up young children and you just do not have the time or patience to learn and benfit from the positive relaxing techniques like meditation. You are always experiencing a physical and emotional state at any given time. Although there are a wide range of emotional states that we can experience. Like fear, anger, anxiety, depression, sadness, guilt, shame, embarrassment, happiness, love, joy, relaxed. They all fall into two categories positive or negative states and everybody has a choice whether they want to change their emotional state. This means that you can either change your emotional state to a positive one or negative one, and everybody wants to feel good. This means that you have the capacity to change how you think and feel at any time you wish. Once you know how to alter your emotional state, you will have full control of how you wish to feel, meaning no more long periods of stress or negative emotions. At one time it took a lot of time and patience for people to reach deep states of relaxation, but these day, thanks to the advancement of technology, you can quite quickly start to mimic the same levels of deep relaxation of the more advanced meditators reach. If you're looking for fast and effective ways to reach a deeply relaxing state, such as what you experience with meditation. without having to spend a lot of time becoming a mediating expert. Then the Mind Place Company can offer you a range of devices that can help to transform you into deep relaxed states. And the great thing is, the devices do all the work for you. So whether you want to reach a deeply relaxed, alternate states of consciousness or just want to relax and unwind after a stressful day so you can experience and enjoy all the health benefits that relaxation can offer you. Then Mind Place can help you reach deeper levels of tranquility and meditative calm, which can also help you to increase your focus and unleash your true inner powers, potential and creativity. Mind places most mature product yet, Kasina - ﻿This Pali ﻿term refers to an ancient system of meditation that uses visual objects to focus the mind. 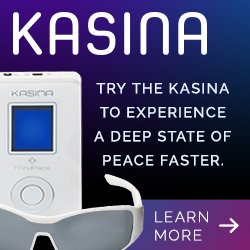 The MindPlace Kasina can be used in a similar manner to induce positive mood shifting effects. Find somewhere quiet and just get yourself into a comfortable position or relaxed position, put on your earphones, choose a session, put on the ganzframes and as you begin to relax and switch yourself off from all the stresses and strains of the day. Your mind will naturally at tune to the same frequency as the session you choose - in the same way that tuning a fork works. Imagine a world of pure jewel-like color illuminating your visual and mental fields. Examples of session types are: meditate, focus energy, night voyage, trance, and mind-art.